The U.S. Energy Information Administration is projecting diesel fuel prices to spike for the remainder of the year as global oil supplies tighten due to political reasons and supply lines damaged by tropical storms. This short-term price increase, however, could easily continue into 2019, according to the federal agency’s forecast. So how can fleet managers mitigate those rising fuel costs? Our On-Highway team has a few ideas. Race car teams obsess over the aerodynamics of the vehicle in the push for increased speed. The same technology has filtered down to the trucking industry. Tire covers, side skirts and nose cones are just a few of the devices that have been designed to improve the airflow around commercial trucks. Done properly, these add-ons help improve fuel efficiency. But too often these pieces are added without thought about how they work together. For drag reduction to be most efficient, it needs to be thought of and treated as a comprehensive system. Switching from a manual transmission to a fully automatic transmission increases fuel efficiency in addition to several other benefits. Fully automatic transmissions like Allison operate by seamlessly multiplying torque and transferring power to the wheels. Power interruption between shifts is negligible. 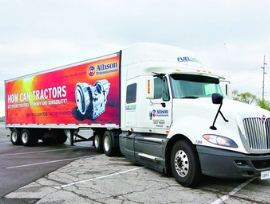 The Allison transmission also allows a fleet to operate at higher average speed and haul more loads, which increases profits. Drivers are more comfortable and aware because they don’t need to worry about manually shifting gears. The human factor can’t be ignored. A heavy foot on the accelerator or sudden surges in speed can guzzle fuel and drive up expenses. Studies have shown that maintaining a steady speed will reduce fuel usage. Adhering to recommended speed limits and monitoring traffic to limit stopping as much as possible are two easy ways to improve a fleet’s mileage. Tests have shown that adhering to speed limits ultimately will lead to reduced fuel consumption. Following a routine maintenance schedule can not only save money on the wear and tear of your fleet, but help with fuel costs. A truck running with an engine that isn’t operating efficiently isn’t going to use fuel efficiently. Our experienced and factory-trained On-Highway techs know how to keep the vehicles in your fleet operating at peak efficiency. Contact us today to see how we can improve your fuel costs. When you’ve got a fleet of buses that will travel 1.5 million miles in a lifetime, uptime is a premium. You need those buses working and keeping your passengers safe. For Greyhound’s fleet in the Pacific Northwest, that means trusting their repair and maintenance work with us. Well, specifically with Pat Ryan’s crew. Pat is the foreman for our On-Highway Service Center in Kent, Washington, and has been involved with Greyhound buses for 35 years. That longevity and expertise is why on any given week there will be one to four buses in our service bays. “They trust us,” he said. Pat learned the ins and outs of Greyhound’s fleet by spending the early years of his mechanical career working on the company’s bus engines in the Seattle area. Engine repairs, engine swaps and transmission work were all part of the daily routine, whether it was an emergency repair or scheduled maintenance. 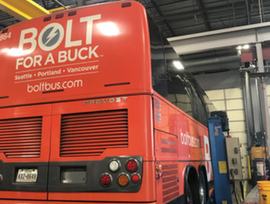 Greyhound expanded that relationship with Pacific Power Group in 2012 when it brought Bolt Bus to the West Coast. The premium bus service travels between Vancouver, British Columbia south to Eugene, Oregon, with numerous stops along the route. To understand Greyhound’s continued reliance on our technicians, consider that the bus company’s current lead maintenance manager used to work at PPG. 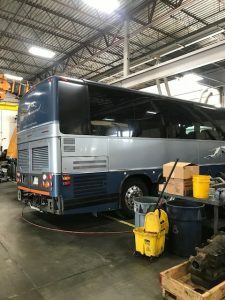 The Prevost buses used by Greyhound and Bolt are kept on a strict maintenance schedule that dictates whether parts will be repaired or replaced with new equipment. 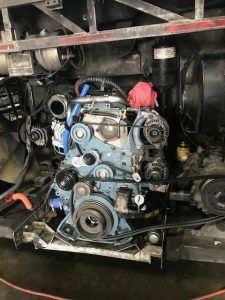 That schedule means our technicians will swap out 10 to 20 engines each year for new ones and an equal number of installations for new Allison transmissions. Much of the workload falls to Dough Richardson, one of our Kent team’s top technicians that handle bus repairs. Recently there were three Bolt buses in the shop with one awaiting a new engine and new transmissions going into the other two. Pat described that as a pretty typical week. Given the history with Greyhound, it’s no surprise the company constitutes a significant amount of the repair work done in Pat’s shop. That means Pat’s factory trained crew understands the customer’s expectations, and are well versed on the equipment and know what it takes to keep the buses running on schedule.